I know he was a tirthika, but if I recall correctly Robert Svoboda's guru was pretty deep into horse racing. I knew a guy who used to work during summer really hard and then spend rest of the year living in a room and doing four sessions a day. So it is possible. Really depends, whether one has the balls to do it. Or one can develop mindfulness in every moment and do guru yoga, plus one or two sessions per day of some practice. Good examples. We should have a thread about strategies for keeping practice in while struggling along in the West. I think if you are already significantly advanced it is easy. You just need a place to stay where you don't have to pay rent. The only other expenses are the food, which can be very inexpensive. But if you are not that advanced you need to travel to meet your teachers, receive empowerments, instructions, etc., which requires a lot of money. Yes of course. That is very normal. But it seems that many people in the West are stuck at that phase for decades without really doing retreat. Plus developing mindfulness that is supported by daily meditation is not that hard really. And one can live normal life. Yes, I think you can make enough progress while working etc. Enough to recognize in the bardo. But I doubt that you can attain buddhahood while still alive in this way. And possibly not even a level where you can teach others. Though that may depend on the person. Yes, that really is hard to say. I do believe it really depends on the individual. I know a guy who has been practicing only for like two years and has made 5 times the progress I have made in 6 years. Mostly because he really dived into it and does retreats whenever he can. If you want to get realization in a life time you have to devote yourself to that fully. It can be possible when you have the capacity to do it while working, etc. But yeah. The rest of us might have to give up many things and live more humbly in order to achieve buddhahood. Yes, that really is hard to say. I do believe it really depends on the individual. I know a guy who has been practicing only for like two years and has made 5 times the progress I have made in 6 years. Mostly because he really dived into it and does retreats whenever he can. What do you mean retreats? Just personal retreats at home, or attending retreats with lamas etc? Personal. I think those matter the most. There really is a reason why so many masters give teachings and send on retreat then again give teachings and send on retreat. Or at least it was like that. If one wants the causes and conditions in the future to be able to practice with ease then one should act NOW to generate them. Well. That’s why we do mandala offerings, ganapuja and stuff. And honestly I don’t have that much Merit I really have to work on it. So recommend to people to do these, rather than recommending they gamble on the stock market. I’m just giving an example. The example of people working summers and practicing winters is just as good. Pls don’t order me around. I’m not a Communist from europe. And to be clear no amount of pujas will train you for a job. You have to gain the wisdom of knowledge and experience in worldly affairs. Pujas help will patience and stuff. 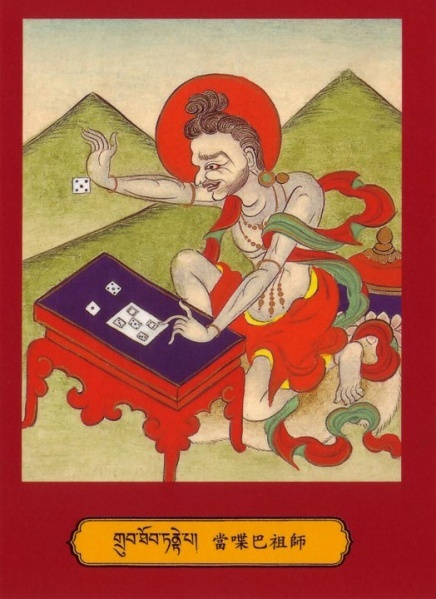 Now go find me a Buddhist text that extols the virtues of gambling, from any tradition you wish. Relax in the continuim of pure pleasure." He didn't advise him to continue gambling, he advised him on how to utilise the energy of the affliction, in order to liberate rather than enslave himself. Well, he didn't tell him to stop gambling either. The point is, chill.